Now that the Tornado assembly code is available to the Coders within the development team, it is time to think inside and outside of the box. What do we do with the code? Short of a total re-write of the code to run on today's PCs and graphics cards, in this post, I am listing a few features for Tornado using the existing 16-bit code, which I think can ... might ... possibly be done. I could be wrong though. A lot depends on the existing people (Kevin, Heinz-Bernd, etc,) who may or may not have the time to involved in the re-design and coding process. These are just off my head, and without losing sight of bigger things for the Tornado project (like up-to-date graphics and higher screen resolution, and making airsick gamers). (1) Increase the density of trees...even if it is just an additional one or two trees in a copse (group of trees). Artist's impression of more trees per copse (cluster). Better if more trees could be added of course.Technically speaking, maybe by using a DOS extender or something that can overcome the 640Kb limitation. (2) Edit the existing cockpit designs. Technically speaking, this can only come true if one knows how to encrypt a LBM file into PT2 file. Without this knowledge, then this idea is ... kaput. If Kevin can shed some light on this then there is a chance to mod the screens or Tornado cockpit. 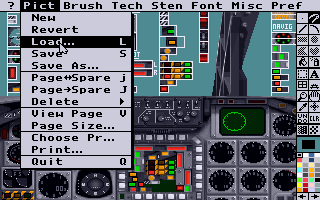 Using the ancient Electronic Arts' Deluxe Paint to edit a raw Tornado LBM graphic file. Or if Heinz-Bernd can reply and give us an idea how he converted PT2 into PCX file format, then we might have a clearer idea how to convert LBM into PT2. But again, even with such knowledge, the re-designed screens would still be limited to the 'awful 1980s and 1990s' 320x200 pixel-screens. There is only so much one can make that type of image look like the real-thing. (3) Introduce more shudder, jitter and vibration into the simulation, especially during flight. Perhaps as a user setting that he can choose to have or not when playing the game. Or make the whole air-frame and forward view more jarring when hit by Triple-A or SAM strike. Right now the Tornado flies too smoothly at 200 feet, as though skating a friction-free surface or ice. No airplane I know flies without some rise or fall along the vertical axis. If you watch the videos of Tornados flying over the Iraqi desert, the plane bops up and down above the terrain. Actual in-game vibration special effects. Running re-heat with the brakes on, going full throttle on the runaway without lifting off. This effect is absent when flying level over terrain. The air-frame will buffet and shudder if hit by AAA or due to catostrophic failure. 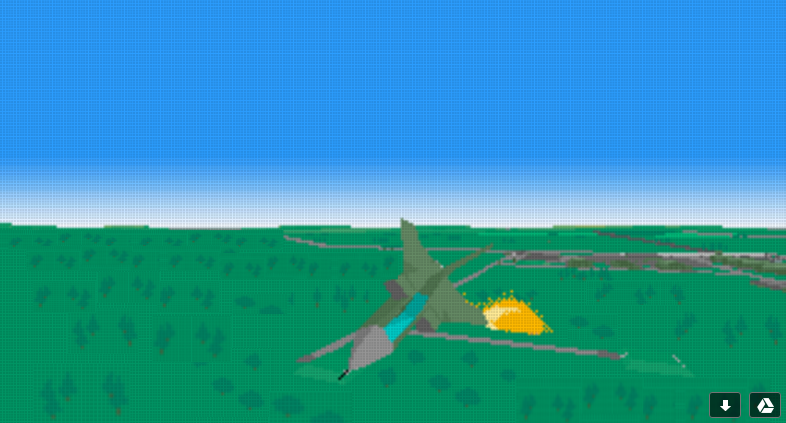 However, the game has zero-buffeting when flying normally. Me thinks that some in-flight buffeting would be nice to have. As it is, in Tornado, when the plane is on the runaway, the cockpit and view of the outside will ALREADY realistically shudder and vibrate when I hit the Shift-Plus key to activate full afterburners (reheat as the Brits will say). So I think it should be possible to introduce some vibration effects in-flight, whether at 200' or 20,000' above ground. That would give not you the throw-up inducing effects that you want in a flight sim that makes the gamer reach for a barf bag, but at least it's a start. 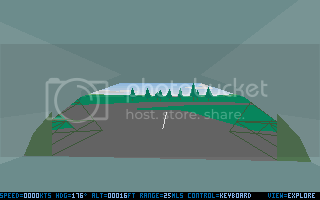 (4) Have a forward looking view that only has the HUD. Currently, if you toggle/hit the '6' key, the cockpit's left and right iron-frames will disappear and reappear. So my idea is that if the whole cockpit were be toggled on and off instead, then the gamer will see more of what is in front of him. Not realistic of course, but from the game point of view, it would be fun to have. Below is a glimpse of what could be. Artist's impression only. 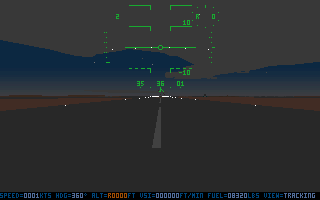 Front HUD-only view with cockpit and controls toggled off. Plane is sitting pretty on the runaway. In my humble opinion, with the emphasis of the game being mud-moving and ground-pounding missions, having the default forward view being able to toggle the entire cockpit on and off might be interesting. What do you think of this HUD-only view? Does it enhance gameplay? Does it detract from reality? Please share your thoughts. SO, if any one of the above (1) to (4) could be implemented (and I am sure I can think of a few more visual improvements), I would be a one-very-happy-clam. If none can be implemented, I am still happy, though not like a clam. This is because, hey, I finally got the source code and I can dream about modding it. Haha. What's your wishlist? Realistic, optimistic, pessimistic, outlandish, anything. Your say. 6) communications as they were possible in Euro Fighter 2000 --> speaking with wingmen and responding to the AWACS and Airfields . a) Waypoint data could default to the current waypoint when Look Down is first selected and then perhaps a keystroke would allow cycling through all waypoints in the flight plan. VERY helpful to recall upcoming speed and altitude changes during a mission! 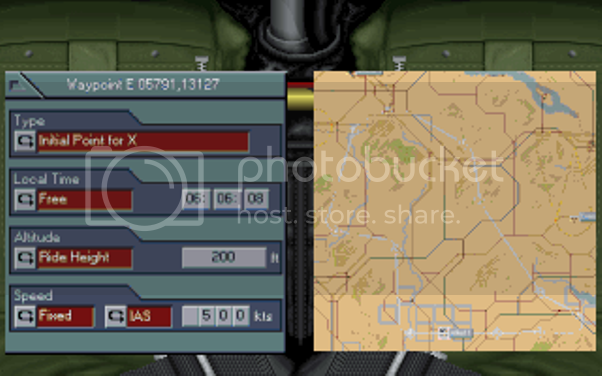 b) The flight plan map could default to the whole route with the ability to zoom in/out. Perhaps whatever Key buttons were active in the Mission Planner just before takeoff (such as AA, EWR, CAP, etc.) would display on the map during flight. Nice one. And very interesting. Although with all the bells and whistles on, the mission planner, in its half-screen size would be a wee bit hard to read due to the limited screen real estate. If the user were able to expand the map in full-screen or at least expand it to 2 times the size, then the details and key sub-windows would be easier to read. Ah Speedwagon, now you have got the hang of inserting images into your DOW forum posts. That's progress. Keep up the good work! Thanks Frankie…I have a good teacher! 8] Full-axis control of pitch, roll and yaw -- along with air brakes and throttles -- using a single joystick (or joystick/pedal combination). The Tornado manual discusses use of a second joystick to control rudder and throttles…so the capability seems to be there. Not only would this greatly improve control during manual flying but finally make formation flying a practical idea in Tornado. 9) Include the option to begin missions from inside a HAS instead of on the runway. (The Mission Planner could factor in an allowance for taxi time.) This could really add to the challenge of keeping to time-on-target, especially at night! On multi-Tornado missions the other aircraft would simply follow you to the runway. Would create some nice external views to check out, too. How about starting the mission from inside a HAS? Thanks to Tom N for suggesting this wish. 10) In simulation mode, it would be nice to be able to select systems to fail at preset times. Specifically, a timer is set for each failable system. For example, the default fail setting for each system is set to 99 minutes within game (so as to never fail). That 99-minute fail system is shown in green. A 45-minutes fail setting is shown as yellow, a 10-minutes fail setting shown as red. Finally, a fail setting of 0-minutes is shown as black which indicates that the system has already failed even before takeoff. RAF Marham, erm...we have a problem. 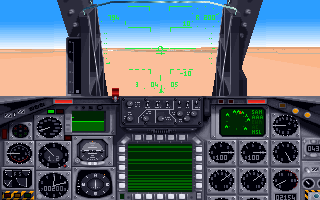 In this way, it is possible to simulate a landing in simulator mode with every possible setting at once, without relying on a missile to hit the preferred-to-be-hit systems. In short we can make the Tornado fail in N different ways and in M different combinations of failure systems, without leaving it to chance for the enemy A.I. (AAA and SAM batteries) to take out the systems. Nice idea, Tom N. Like getting achievement badges. In some software systems, it is called gamification. Having only a little read about big losses of wild weasel F-105 aircrafts during vietnam war to enemy SAM's with visual evasive maneuvers only, i thought about improving realism giving the Tornado-Sim the same possibility to fire up to 4 missiles at once from the surface, giving even while maybe evading all four missiles at least the feeling of a small shower, as it should be. 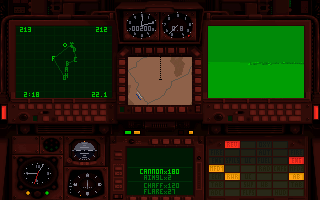 EDIT: In combination with # 10 simulation mode enhancement (--> turning off RWR = radar warning receiver AND enemy CAP =combat air patrol) it would be possible by laying the waypoints over known enemy SAM sites to revive that special wild weasel feeling of the USA-war in North Vietnam (as unfair and unjust it may be nowadays) !! Hard enough, but a part of warfare history about severe losses of many innocents , brave (or desperate) soldiers on both sides and sacrifices and high risks. A game is then a good game, when it makes you think about the whole thing, not only the joy of playing or the tension/excitement and the playing time, but the setting and the framework, to feel the circumstances and to get interested to get more background information about some points of (long) past times. I think Cunningham had to evade up to 6 SAMs at one time in his F-4 Phantom. He was war hero, an Ace, and a surviving POW. Unfortunately in the later years he messed up big time in politics and became a convicted felon. #14. Visible SAM smoke trails.